When I started cooking more meals at home, I became more aware of food temperatures. When you’re cooking meat on the grill, in an oven, or in a slow cooker, how do you ensure that it’s fully cooked and reached the minimum cooking temperature? The answer is a kitchen thermometer. Over the years, I’ve had a few different kinds of kitchen thermometers – starting with the non-electronic dial version, with the needle that sloooowly moves around the dial to the temperature. Unsatisfied with accuracy and how long it took that thermometer to read temperature, I “upgraded” to digital thermometers. And although I accidentally killed one by dropping it in water, I’ve been happy with their performance. However, since receiving the Professional Secrets Thermometer, I’ve learned that not all digital kitchen thermometers are the same. When choosing a new kitchen thermometer, the time to show the food temperature, durability and ease of temperature reading are all important factors. The Professional Secrets kitchen thermometer thoughtfully addresses many of the limitations of other kitchen thermometers. 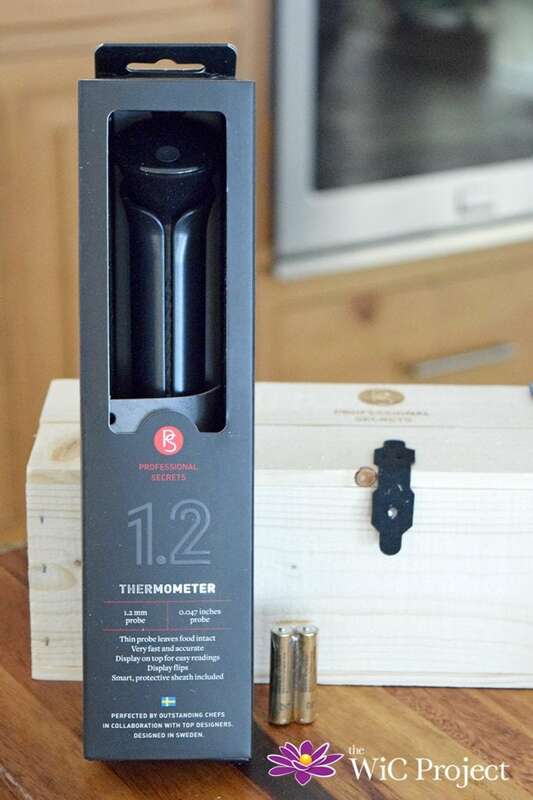 Here’s why the Professional Secrets kitchen thermometer is the ultimate kitchen thermometer for every home or professional chef’s kitchen. When you’re opening ovens or lifting lids, as you feel the heat or steam blasting your face, having to wait for the temperature to slowly tick up on a dialed thermometer can seem like eons. The Professional Secrets thermometer reads food temperature almost instantly. At just 1.2mm (0.05 inches), the thinness of the probe allows you to measure temperature without leaving giant holes in your meat or baked good. The auto-rotating digital display on the thermometer is probably my favorite feature. Regardless of how you position the thermometer, the display will rotate to be upright. No more twisting your neck or trying to read numbers upside down. Also, the bright blue numbers are easy to read – even when measuring the temperature in a dark or unlit oven. You can choose to display the temperature in C° or F°. It might seem like a little thing, but it’s important to me that it’s easy to clean the kitchen thermometer. The water-resistant design means I can easily wipe the thermometer clean. Once you’re done cleaning, just store the thermometer in the included protective cover. The cover/case has a clip on one side so you can easily clip it to your apron or shirt as you’re moving about the kitchen. 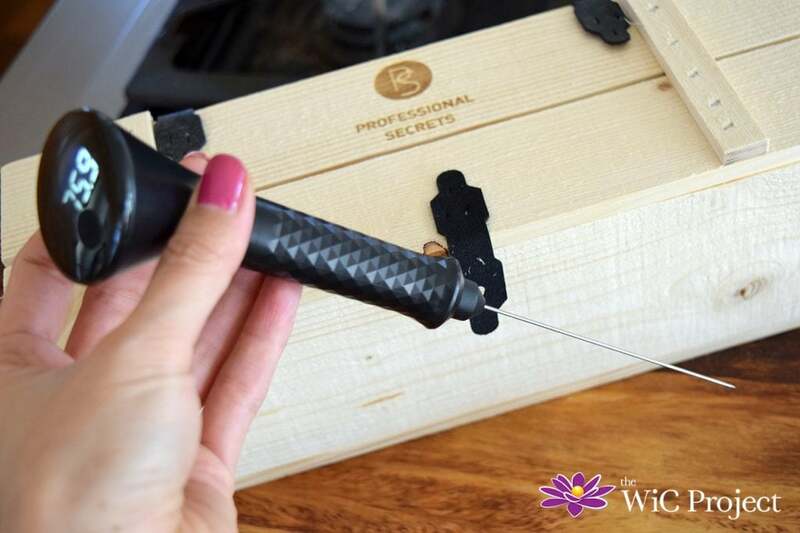 Quickly measuring temperature, easy-to-read display, and water resistant design are just a few reasons I love the Professional Secrets thermometer. 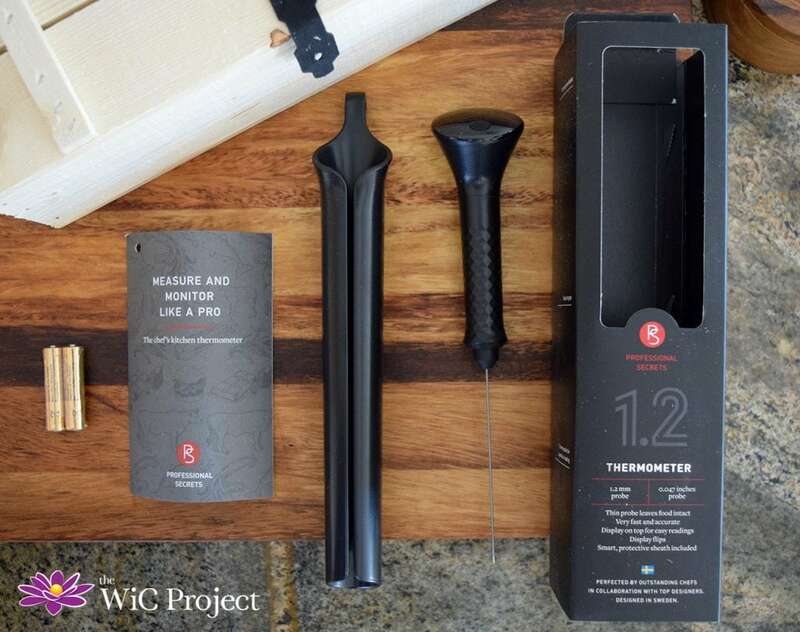 I definitely recommend you keep it in mind the next time you’re shopping for a kitchen thermometer, or if you’re looking for a useful gift for a home chef. Visit www.professionalsecrets.com to learn more about this kitchen thermometer and to discover more essential cooking tools for home chefs. Do you use a kitchen thermometer? 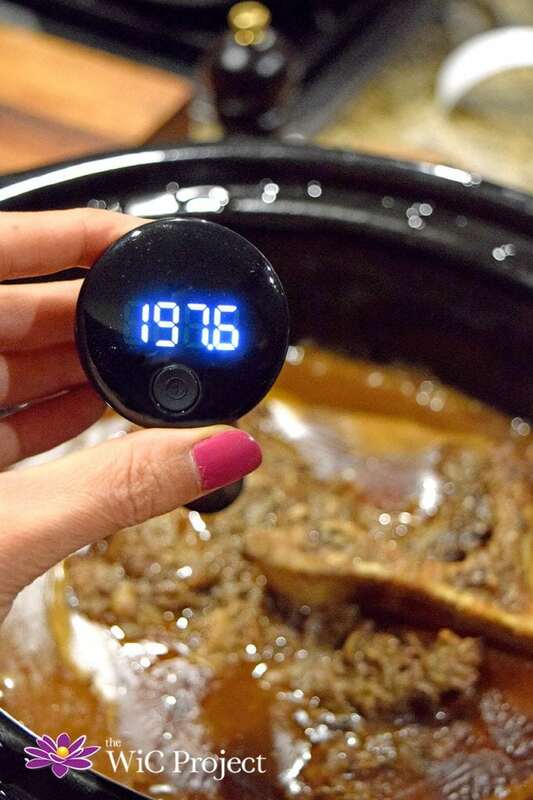 This sounds like a great product for people to have in the home, I love that it makes checking the temperature of your food so quick and simple. It is quick and simple to use! I use the thermometer more than I thought I would too. Chicken, steaks, roasts – anything that requires more than a few minutes of cooking time gets measured. 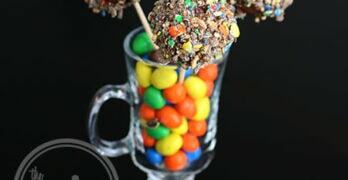 This would be a wonderful investment for our kitchen. I love that this would give me the piece of mind when making dinner for my family. I use the one which has the needle on the dial. This digital thermometer would make things much simpler! I’m surprised by how much I appreciated the difference in measurement time. With digital, you open the oven and BAM – temperature. With the dial, your face gets nice and toasty as you wait for the dial to stop moving, LOL.